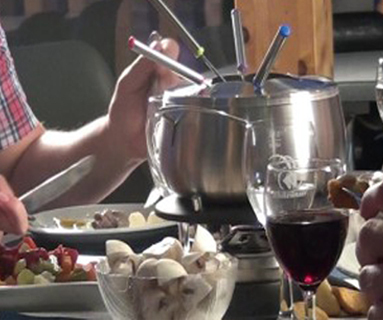 Enjoy from November to March our favorite Fondue Chinoise Experience from SFr. 59.00 inclusive 2 hours bowling. As a group of minimum 8 person, a familiy or business party, the Fondue Chinoise Experience at the OZ Bowling – Blackstump is alwayy something special. Monday – Thuersday 59.00 SFr p.Pers. Friday – Sunday 64.00 SFr p.Pers. Monday – Thuersday 64.00 SFr p.Pers. Friday – Sunday 69.00 SFr p.Pers. Monday – Thuersday 69.00 SFr p.Pers. Friday – Sunday 74.00 SFr p.Pers. Meat:Beef, Chicken, Veal, Kangaroo, Pork, Pute, ostrich und Horse. The price depuends on the number of poeple, quantinty and assortment of meat, sauces and side dish. Our experienced team is happy to help in the planing.